As many people may know, I was a candidate on last year’s show. What people might not know is that my idea was, like Vana, an app. It is now my business The Link App. Despite not winning I went on the launch my app regardless. The final is always an interesting episode and this one didn’t disappoint. It’s been few weeks since I have done a review for The Apprentice, sorry about that but I am so busy in my day-to-day life TV is the last thing on the list. I make a special effort to watch it to compare it to my time on the show and to get the blog done but I wouldn’t be good business sense if I let it take away at all from running The Link App. Anyway, I am back. I concluded a call 5 minutes into the show so watched almost all of it. Week 8 so a more serious stage of the programme, those left standing have done well to get to here. This week’s task was an events planning one, children’s party planning to be specific. It had lots of promise to be a fun episode but it was a bit flat for me. The editing team decides what particular aspects are going to be heavily featured and this week it was the turn of health and safety. As a lawyer this pleased me immensely as a viewer not so much. I got to the end of the whole thing feeling there were fewer than usual business lessons to be had, save for Richard’s well thought out but poorly delivered comments about focussing on the margins. I think one of Lord Sugar’s assistants may have uttered the customer is king- or words of that sort. I am not the biggest Apprentice fan or anything but I do like to make a case for its relevance on UK television if it somehow at least ties to business lessons and they have a glimmer of hope to inspire a younger generation to be entrepreneurial. However either I missed them in the five minutes I was on the phone or they were sadly lacking. Also not a lot in the way of entertainment for me either. I do feel Gary’s team was somehow on a road to failure as soon as the nut allergy was mentioned, that no matter what happened from that point they were lining up Lord Sugars puns about the mother going out on a stretcher etc. Allergies are a serious issue of course but no doubt the options were limited and drama expected. In the end David was the one fired. I knew he wouldn’t last (see my previous blog) even when he won as project manager. There is a particular type Lord Sugar seems to prefer and no slight on him, he’s not it. From the clips we saw he wasn’t particularly entertaining in his role and it was clear he was the weakest target for the other three left in the final boardroom to pick off. Next week’s episode is property sales, now that should be interesting. Zanna Van Dijk interviews me about fitness business and life! I had the absolute pleasure of meeting the gorgeous Lauren Riley at a press event earlier this year. As a woman in business myself, I find her incredibly inspiring. She is a successful entrepreneur with a lot of knowledge to share, I hope you enjoy getting to know her. Where to start…I’m Lauren Riley and I’m a lawyer, public speaker, blogger, vlogger but most recognise me as a business woman. I founded The Link App a communication tool revolutionising the way law firms interact with their clients. I was on BBC The Apprentice last year so I can be found on the odd red carpet too. I am super keen on health and fitness although at the moment I’m working 6-7 day weeks so this is suffering much to my dismay. I promise I am not just saying that because I am talking to you. I think keeping on top of my body, keeps me on top of my mind and I’m just a normal person outside of my business, I am quite girly really and where I can I like to look good. Travel is a major passion of mine, I’ve been very lucky and been round the world a few times but its hard right now with all that’s going on with work. Currently loving life as a newbie to London town, I’m a bit of a social butterfly! You know what it was actually a lot of fun to film and it been an amazing place to start a business from so I can’t complain. I always say that he is exactly the same in person as he is on television. So if you think he’s lovely then he is, if you think otherwise… you are also right. That’s my diplomatic answer but the whole process is designed to be scary or it wouldn’t make good TV. We won two awards last week including the most inspiring TV show so we must have done something right, thanks to all those who voted. I have one of the awards on my dresser at home. You’re a successful entrepreneur, can you tell us how your career developed and progressed this point? Sure. When I was younger I wanted to be a barrister or an actress. I was close… I’m a solicitor. I was pretty proud of that being the first generation in my family to go to uni. I worked in the civil service to help financially through my course. So although I did a straight academic route I always had to work pretty long hours. When I graduated I was completely fed up with exams and only part way to qualifying as a lawyer so I took three years out. I worked abroad and enjoyed my early twenties, enriching myself with travel and life experience. After a year I went to do a business graduate scheme as I was always interested in business, I loved the skills but hated the job so went running back to the law. I qualified from my post grad with distinction and was lucky night to land a training contract that year. I put this down to my ability to talk but mostly the ‘mistakes’ I had made, taking three years out to pursue something outside the law gave me ‘commercial awareness’ and that’s very important no matter what your industry. Then when I qualified I was a divorce lawyer and I enjoy that side of my work but I spotted a huge opportunity for technology to improve the way lawyers work for the benefit of them and their clients. The idea for The Link App just wouldn’t go away and I eventually went for it with the thinking that it would take off slowly but from almost day one the reaction was amazing. I feel very blessed and I LOVE what I do. As my journey isn’t conventional I am asked to speak regularly and I love sharing my journey through my talks and my blogs. You are smashing life right now! How do you juggle everything you do – especially with an interest in health and fitness? Being completely honest, if you’d have asked me about fitness a month ago I’d have said I was doing alright. Just recently there has been zero hours in the day for me and I hate to admit that as I strongly believe that balance is the key to a happy life. I’m still in OK shape as fitness is such a priority so if there is ever even a small amount of time, I’m on it with HIIT type exercises. I get up early and go to bed late and work every day except Sundays. However I am NOT complaining, I love what I do and I realise it’s a choice. I took on a lot but I don’t want to give up any aspect of my work. I love blog/ vlogging it’s a form of self-expression and I only agree to take on brands that compliment my lifestyle. For example I’m passionate about fitness and tech so I’m working with Move GB at the moment, it’s an app that allows you to have flexible access to hundreds of gyms across London. Working with fitness and technology, two of my things, does not feel like work! Same with law, I am passionate about my clients and as The Link App is aimed at lawyers it make sense for me to understand them from inside the industry. There’s no magic formula I can share I am afraid, it’s about hard work and surrounding yourself with the right people to support you. There is that famous phrase something like “entrepreneurs spend a few years like most people are not willing to, to spend a lifetime like most people can only dream of”. If it all works, I will take my downtime then…..from a villa in Barbados and I will work out every day and look like a Victoria secrets model haha. Can you summarise your own personal approach to training and nutrition? Sure, I don’t like to mess about. I am time poor determination rich so I chose high intensity every time. Classes like Insanity, kettlebells etc. I do like the body weight stuff, burpees, pushups etc but I’m also a fan of weight training. I quite often Instagram the stuff I am up to in the gym too, battle ropes etc. When I was employed I went to the gym 4-5 times a week and that’s what I would still like to achieve. When I’m being good I eat ‘clean’, everything from scratch, nothing processed etc. I also instagram my food from time to time. I am not perfect though and do indulge in things that I know aren’t great from me. I think life is about balance so if you eat right most of the time that’s OK, 80/20 is a good principle. I am a massive fan of hot lemon water in the mornings and religiously drink green tea. I can imagine you’re pretty busy – what is a typical day in your life? There is no such thing. One day I will be chained to my desk 8am to 10pm pushing through things for the business. The next I will be in my own law firm seeing client, or in other law firms giving training on how to use The Link App. The next I will be travelling to give a motivational talk elsewhere in the country or at a launch of a product for the blog and that evening I could go to a celeb event; although I usually only allow myself time for these if they are for charity or a brand I like. The good thing about the blog/ vlog is that I will nearly always be doing things I love; like taking spa breaks or trying out beauty or fitness products, so that’s really like my time off. If im lucky I will have the time to eat right and smash it in the gym. I love seeing whats on peoples plates. What does a typical day in your diet look like? Good question, breakfast is nearly always scrambled egg made with oat milk and spring onions and hot lemon water and green tea. Lunch will be chicken cooked in coconut oil and soy sauce with broccoli and flax seeds and dinner will be similar to lunch. I try and make double portions so I only have to cook once. I live in London so I eat out too much, steak is my favourite! Everyone else seems to hate burpees, but I personally love them! What is your ultimate favourite exercise move? I wouldn’t go as far as love, but I actually do like them because you can smash though them in a relatively short period of time and they really work to change your body. I am with you on the burpees. If you could go back and give yourself one piece of health/fitness advice and one piece of business advice what would they be? Business: don’t be so hard on yourself. You are not making mistakes when figuring out your path. They are all just lessons leading you to where you are meant to be. Fitness: educate yourself first. I spent years in the gym doing low intensity stuff and eating badly and it was doing nothing for me. Well done on all your success! What are your future plans? Thanks lovely. Well I have only just start the vlogging channel. I am lining up some fab things, among them interviews with people like you, Amy Childs, Olympic athletes etc. I want to give people a real insight into my life and advice and that of others. The channel is www.youtube.com/c/misslaurenriley so that is very exciting. New thing happen with the business everyday so I cant wait to share how that turns out with you all! So the weeks of trying to learn everyone’s names while it looks like there are dozens of them running about are behind us, 14 candidates remaining at start of this week. I was thinking we might get a double firing. Not this week so the next two episodes I would say. The ominous phone call comes, candidates to be at St James Square with 30 mins to get ready. That annoyed me as when I was on it, we only got 20 mins, one likes to looks ones best when there are up to 10 million people watching you. Elle questioning whether it was worth getting out of bed for, a funny moment but not the motivated start you would look for in your next business partner perhaps. 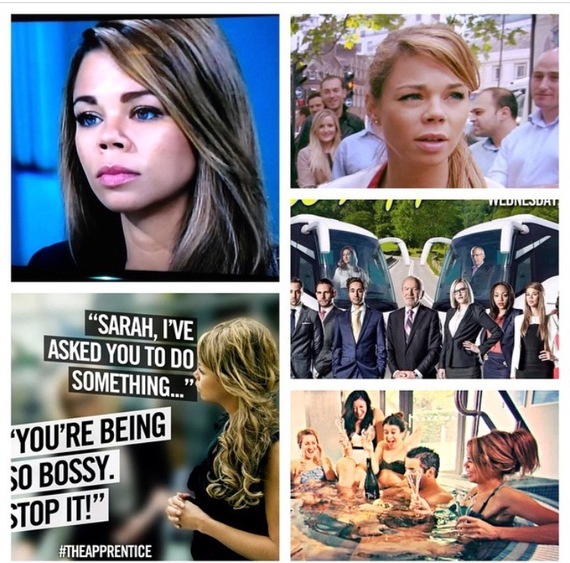 The Apprentice Series 11 Ep 4 – My view! So we are well and truly underway with series 11 now. Something has VERY much impressed me about these candidates, particularly this episode, I will reveal exactly what at the end of this post.